The Irish interest in Kant spans back to Dr J. A. O’Keeffe, whose 1795 Essay on the Progress of Human Understanding included a description of Kant’s conception of the aims of philosophy. We know little of O’Keeffe but we do know that he attended lectures in Leipzig given by Friedrich Gottlob Born, who was translating Kant into Latin. O’Keeffe’s radical leanings were manifest in the book, adding to heated English debate on Kant in 1796, and increasing the association of Kant with radical ideas in the English mind. O’Keeffe had translated sections of Kant’s Critique of Pure Reason in discussing it, but the first full translation was by the Scot John Richardson in 1797, and attracted little notice. By 1819 Kant was better known in England, and Richardson published additional translations with limited impact. Mahaffy (1878, p. 207) argues for Sir William Hamilton (not the Irish mathematician), along with Semple’s translations, as the driving force in the 1830s for the study of Kant in Britain, and certainly Scottish translators and commentators were active from the late 1830s on. [T]he first impetus to a real and honest study of Kant’s whole system, facing every difficulty, and shirking no detail, was given in a very curious and unexpected way. In the year 1862 a new examiner for fellowships in Trinity College, Dublin, Dr Toleken, who had never published anything, but was known among us as a deep and thorough thinker, set a paper in metaphysic that came like thunder out of a clear sky. We were asked about the synthesis of apprehension, and the productive imagination, and the schematism of the categories, such questions as took away our breath, and sent us looking in vain though the commentaries and pretended explanations for their answers. The first real light upon the darkness…came, to me at least, from the commentary of Kuno Fischer, which brought to its aid the first edition of the Critick, already drawn out of forgetfulness by Schopenhauer. This book, and earnest study of the original [Critique], tested yearly by a new paper by Dr Toleken, created in the University of Dublin a school of Kantians, who, whatever their faults or their want of originality, were at least so far original that they have taken the pains to master the system which they studied. Mahaffy credits the Irish Kantian school with clearing up misunderstandings about the Kantian system that were prevalent at the time. He suggests that “Analytic and Dialectic were almost a sealed book” to previous commentators (p. 228), with Kant’s refutation of Idealism being widely misread. John P. Mahaffy (1839–1919) failed to get his fellowship in 1862 and 1863, finally succeeding on the third attempt in 1864. Academically Mahaffy worked in many areas, producing more than thirty books and numerous articles. His first work was philosophical, translating and editing Kuno Fischer’s German work on Kant’s Critique of pure reason, which was published in 1866. He then produced an incomplete two-volume Kant commentary of his own in 1871 before turning his attention to ancient history where he established his reputation and gained financial success. They were also controversial: Mahaffy’s first historical work Social life in Greece (1874) included a frank discussion of homosexuality which was removed from later editions. It is reported that the proofs were read by Oscar Wilde, who Mahaffy tutored from 1871-4, and whose wit reputedly influenced the young Wilde. Mahaffy later wrote on Descartes and was Provost of Trinity from 1914 to 1919.He also agitated against the use of Irish in education. Mahaffy returned to Kant in a two-volume work produced with John Henry Bernard, Kant’s Critical Philosophy for English Readers published in 1889. Along with a clear, accurate translation of the German, Mahaffy provides an explication of Kant’s metaphysics. The major contribution from Bernard was a commentary on the Dialectic of Pure Reason. John Henry Bernard (1860-1927) was born in India but lived most of his life in Ireland. He became a Fellow of Trinity in 1884 and was ordained in 1886. He held a series of positions in the Church of Ireland and in Irish educational institutions. He was Provost of Trinity from 1919 until his death. In 1892 Bernard published the first complete translation in English of Kant’s Critique of Judgement, together with a helpful introduction. An influential teacher, his later works were primarily theological. He also edited The Works of Bishop Butler. Mahaffy credits Prof. Monck’s account of Kant as the shortest and possibly most complete produced in Dublin. William Henry Stanley Monck (1839–1915) was born at Skeirke, Queen’s Co. (Laois). He won the first science scholarship in Trinity in 1861. He went on to study for the bar in 1869 but returned to academic life from 1878 to 1882 as professor of moral philosophy in Trinity College. He retained an interest in astronomy all his life: in 1892 he was involved with the first electronic measurement of starlight and his 1899 An introduction to stellar astronomy included the first proposal for the unit of distance later known as the parsec. Monck’s account of Kant, An introduction to the critical philosophy, was published in 1874. His preface tells us that it was composed while Monck was in Trinity. Monck asks that it be read as a popularisation of the Critique rather than a philosophical exploration of it, contrary to Mahaffy’s positive evaluation. Monck’s most noteworthy philosophical contribution is Space and Vision (1872) which explores visual perception. Like the 1864 Sight and Touch by Thomas Kingsmill Abbott, it criticises certain of Berkeley’s views on vision, though Monck’s position differs in most respects from Abbott’s. It also rejects the Kantian idea of space as a framework of perception. Thomas Kingsmill Abbott (1829 – 1913) had held chairs in Trinity from 1867. Although he become a Fellow in 1854 before the advent of Dr. Toleken he also was involved with the Dublin Kantian School. He translated Kant’s ethical works, including the Critique of Practical Reason. They were first published in 1873 and remained the standard English version into the 1940s (Duddy, 2004), reaching a sixth edition in 1909. As mentioned above, he also wrote an important critique of Berkeley’s theory of vision. James Creed Meredith (1875 – 1942) published his first contribution to the translation effort with his 1911 translation of Kant’s Critique Of Aesthetic Judgement. The translation is preceded by seven essays on aesthetic themes in Kant. Meredith studied in both Trinity and the Royal University (later UCD) in the 1890s. He apparently studied the “Jesuit Course” in the Royal University at his father’s request, but “he remained…a staunch Kantian” (quoted by Foley, 2009). He studied in Kings Inns in the early 20th century, also receiving a D. Litt from Trinity in 1912. At this time Meredith was also involved in the nationalist cause, joining the Irish Volunteer movement at its foundation in 1913 and participating in gun-running from Germany to Ireland in July–August 1914. When the Volunteers split, Meredith seems to have followed McNeil rather than Redmond. Meredith was appointed president of the supreme court set up by the first Dáil Éireann in 1919. In one of these courts he applied a principle derived from brehon law in a case regarding financial support for a child. Though involved in the creation of the Irish Court system in the early state, his desire for brehon law to be an element did not prevail. In 1928 Meredith published his translation of the Critique of teleological judgement, which like his previous translation contained elaborate introductions and detailed analytical indexes. Both this and the 1911 Critique of aesthetic judgement were republished together without Meredith’s notes as The critique of judgement (1952). From radical writings and gun-running to Ancient Greece and measuring starlight, the Irish Kantians were certainly not boring. In addition to their literary output, their lecturing influenced the thought of a generation. Much of their translations and expositions have since been superseded, but they would have expected no less. As Mahaffy said, it is necessary for each generation of Kantians to work at “rethinking in our own way, and reclothing in our own words, the main ideas of the Great Critic [Kant]” (Mahaffy, p. 208). 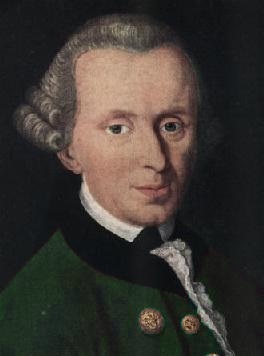 Kant in Green, edit of the portrait Immanuel Kant by Johann Gottlieb Becker (1768). Wikimedia, public domain. Kant’s Critique of Practical Reason and Other Works on the Theory of Ethics  by Thomas Kingsmill Abbott (Library of Liberty). The Critique of Judgement  by J. H. Bernard Library of Liberty. Monika Class (2007) “Dr J.A. O’Keeffe: Irish Mediator of Kantian Philosophy. Life, Work and Legacy” in Eighteenth-Century Ireland, Vol. 22 (2007), pp. 206-214. Patrick Maume (2009) “Mahaffy, Sir John Pentland” in Dictionary of Irish Biography, (ed.) James McGuire, James Quinn. Brian Arkins (2004) “Mahaffy, John Pentland” in Dictionary of Irish Philosophy, (ed.) Thomas Duddy, pp. 220-1. (ed.) James McGuire, James Quinn. Thomas Duddy (2004) “Bernard, John Henry” in Dictionary of Irish Philosophy, (ed.) Thomas Duddy, p. 24. Enda Leaney, Linde Lunney (2009) “Monck, William Henry Stanley” in Dictionary of Irish Biography, (ed.) James McGuire, James Quinn. Thomas Duddy (2004) “Monck, William Henry Stanley” in Dictionary of Irish Philosophy, (ed.) Thomas Duddy, pp. 240-1. (ed.) James McGuire, James Quinn. Cambridge, United Kingdom: Cambridge University Press, 2009. Thomas Duddy (2004) “Abbott, Thomas Kingsmill” in Dictionary of Irish Philosophy, (ed.) Thomas Duddy, pp. 1-3. Tadhg Foley (2009) “Meredith, James Creed” in Dictionary of Irish Biography. Tadhg Foley (2009) “Meredith, James Creed” in Dictionary of Irish Philosophy, (ed.) Thomas Duddy, pp. 225-7.